This post has already been read 790 times! KEARNEY – Clichés are common in the sports world. 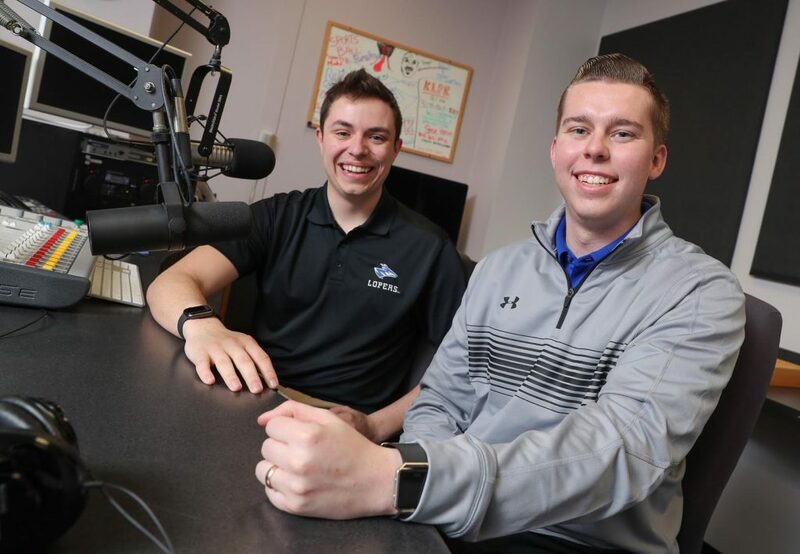 Austin Jacobsen and Evan Jones have likely heard them all – and uttered a few on the air – so it seems appropriate that they’d use one to describe their roles as broadcasters with KLPR 91.1 FM, the University of Nebraska at Kearney’s campus radio station. Do what you love, and you’ll never work a day in your life. His broadcast partner and fellow pregame show host agrees. “Our hobby is literally what we get paid to do. We talk about sports. And that’s what I would do with my buddies when I’m not on the clock. I would talk about sports,” said Jones, a sports management and sports communication major from Cambridge. “That’s the best part is it really doesn’t feel like work,” the UNK senior added. Jones and Jacobsen have worked together the past two years at KLPR, calling Loper football games and hosting the “UNK Gameday” pregame show. They’re also co-sports directors this year. Jacobsen, a junior, handles the color commentary, bringing his bold personality and interesting tidbits to each broadcast, and Jones is the play-by-play man with a “calm energy.” Together, they paint a picture that informs listeners and allows them to visualize the action in their minds. “Before I go out there and call a ballgame, I get chills. I get excited. I get amped up. Part of that is because the listener is relying on you to tell the story,” said Jones, who joined KLPR as a freshman and broadcasts football and basketball games. He also works for Lexington radio station KRVN, covering high school sports, as well as the Lopers and Huskers. Jacobsen has called UNK football, basketball, softball and baseball games over the past two years, but it’s his chemistry with Jones that really stands out. For the second consecutive year, the duo is heading to New York City for the Intercollegiate Broadcasting System College Media Awards, which are presented March 2 at the historic Hotel Pennsylvania in Midtown Manhattan. Jones and Jacobsen are finalists in the best football play-by-play and best sports pregame/postgame show categories for their broadcast of last year’s home football game versus Lindenwood – a 41-14 victory for the Lopers – and the “UNK Gameday” show, which also featured students Cade Cox and Lucas Bolubasz. They were finalists last year in the play-by-play category. Jones called the honor a culmination of the hard work that goes into each broadcast. “There are a lot of hours put into it, so it’s nice to be recognized and have a great opportunity to go to New York,” he said. Their success also says a lot about UNK’s Department of Communication. “The experience you can get here is something you can’t get anywhere else, especially in this area,” Jacobsen said. Students in the sports communication program gain experience in several different roles, from broadcasting and producing to writing and public relations, while developing the skills they need to succeed after graduation. “We get to learn about it in class, then we get to apply it as real-life skills right here at the radio station,” Jacobsen said. Jones said the access to coaches, student-athletes and other athletic department personnel and the leadership from KLPR general manager and senior lecturer Ford Clark also make UNK a great place to study sports communication.